Lemon Creek Winery is hosting its 34th Annual Father’s Day Wine Festival. 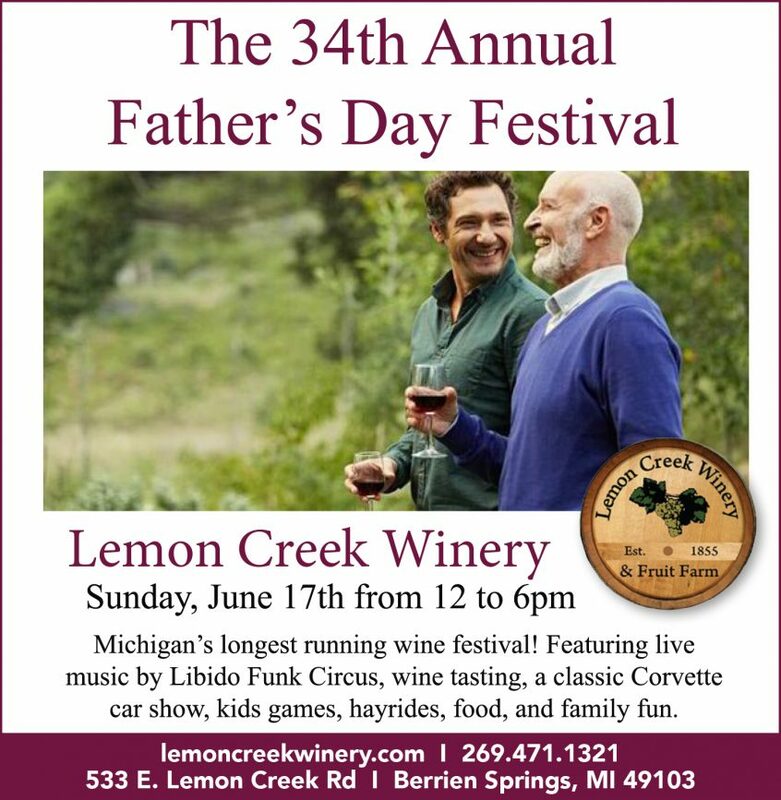 This is Michigan’s longest running, annual wine festival, The Wine Festival and Corvette Show will be June 17th, Father’s Day, from 12 noon to 6 pm at Lemon Creek Winery. There will be live music provided by LIBIDO FUNK CIRCUS, an entertaining dance and party band from Chicago that has become an area favorite. High energy music from the 90’s to the present. The CORVETTE CONVENTRY CLUB OF SOUTHWEST MICHIGAN will be displaying a large variety of their classic Corvettes for Mom and Dad and car enthusiasts alike. Supervised and organized children’s games are available along with a “bouncy house” for the younger children. Hayrides will also run throughout the day for the whole family. Lawn chairs and blankets are encouraged. Coolers and animals are not encouraged. Ribs, pulled pork, cornbread, and more will be available from SMOKIN’ D’s BBQ food truck. Classic Catering will also be on site serving Brie bread bowls, sandwiches, and assorted woodfired pizzas. Admission is $12.00 a person for those 21 & older. Children are admitted free when accompanied by their parents. Admission also includes a souvenir wine glass and a ticket for 3 free tastings of estate-grown, award winning wines. Special sales and new wine releases are featured at the festival. Parking is free. So grab the kids, your Dad and your favorite lawn chair and check out all the fun and festivities at the 34th Annual Father’s Day Festival at Lemon Creek Winery. More information regarding Lemon Creek Winery and Festival rules can be found at www.lemoncreekwinery.com.